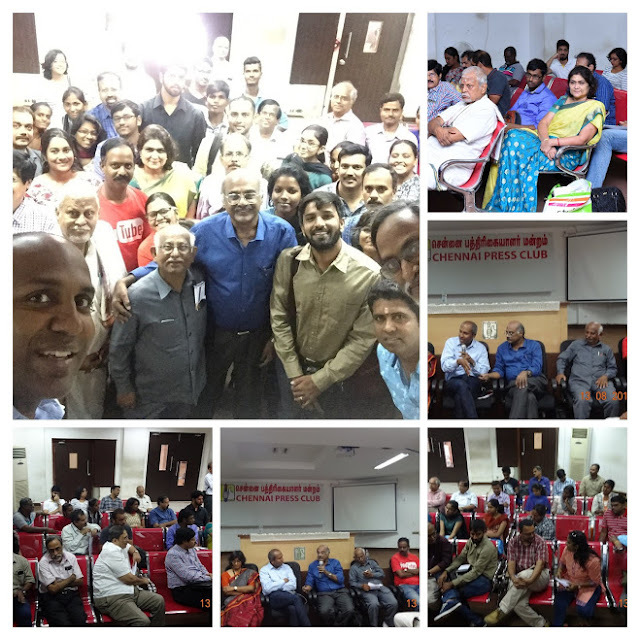 Digital Journalism Association of India (DiJAI) organised an interactive session with Prof. Sree Sreenivasan, Adjunct Professor, Columbia University, Columbia School of Journalism, New York at Chennai Press Club on 13th August 2016. During his discussion, he cautioned all the working journalists and the students about the storm that may change the journalism itself at one point of time. He informed that more than 15000 journalists have lost their job in the print media in US. He said, Digital Journalism is growing at fast rate. He requested all to get ready for the changes and be prepared by adopting to new skills. Prime Point Srinivasan, Managing Trustee and Chairman of DiJAI said that in India 'DIgital only' journalism was growing fast. These digital news media offer the information in a fastest manner. But Srinivasan regretted that these 'Digital only' journalists were not recognised by the Government and other Authorities. Prof. Sree agreed with this observation and said that they faced the same situation few years ago in western world. Now the other countries give due recognition to the digital journalism. He suggested that the bodies like DiJAI should take up with the Government Authorities and convince them. He also touched on varied areas like the current trends in journalism, the urgent need for acquiring new skills, revenue model for digital journalism, etc. The programme was organised by Bharathi Thamizhan (President of DiJAI) and Nurullah (Vice President of DiJAI) at the Press Club. Susan Koshy, Secretary proposed vote of thanks. Many senior journalists and students attended the session. DiJAI plans similar sessions at various educational institutions to create awareness about digital journalism and to get ready for the changes. All the photographs can be viewed and downloaded form this link. Please listen to a brief podcast of 9 minutes covering important aspects of his speech.